Scrappin' Wednesday- One Year Old! 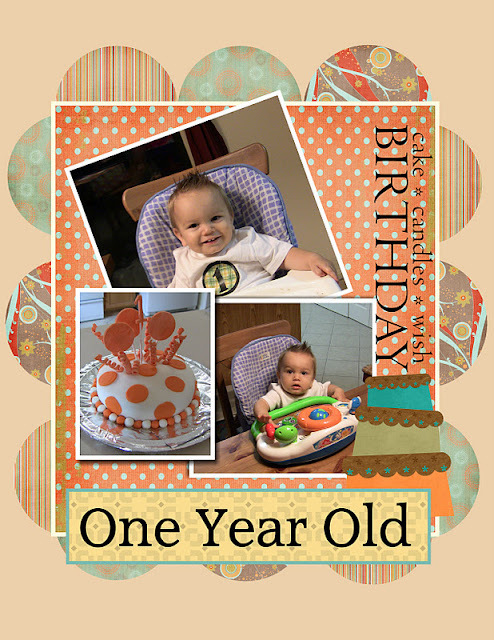 | Occasionally Crafty: Scrappin' Wednesday- One Year Old! Welcome to Scrappin' Wednesday, where I get to share a glimpse of our family life through my digital scrapbooking pages. This week, I am sharing a layout that I put together to celebrate my youngest son's first birthday! We don't have much family in the area, so we kept his first birthday small and simple. I took the opportunity to try my first-ever fondant cake, and I think it turned out pretty cute! I also made him a little shirt for the day, and we got him a fun activity board/walk-behind to play with. We enjoyed our special day together!